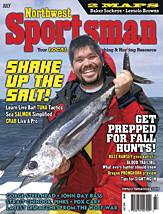 This month in Northwest Sportsman, there is article featuring an interview with me about fly fishing for carp around the Portland, Oregon area. It is written very well, and is worth picking up. I was interviewed by Terry Otto, and he puts his spin onto the article through the interview, and I can say that I enjoyed reading it. Many times in the past, when I have been interviewed, the articles or stories, got twisted to a point where it seems like nothing that I ever said. As an example, I can say that I do not think carp fight like bonefish, but they are something that a flats fly fisher could really enjoy if they live in Portland. In this article, Terry wrote a lot of what I said, and made his points clear. We have a fishery out there that not many people take advantage of. I can say that I am really into carp fly fishing, and it is something I look forward to doing. I would take a day of good carp fishing over a marginal day of steelheading anytime, but I do not want to fish for carp over everything. I just loving fishing for all sorts of fish species. The article makes a wonderful point, in the case of this past spring. When everyone was hunkered down with high water complaining about high water, I was out enjoying banner days of carp fly fishing. We have a wonderful unexploited fishery that is fun, challenging, and super enjoyable. Why not take advantage of something that can provide you with giant grins and laughs.